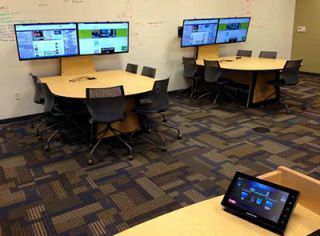 Marian University in Indiana is outfitted with the latest control, video, and audio technology. This collaborative space is also equipped for multiple uses.How to ensure maximum flexibility in a space that’s constantly changing? Multipurpose rooms are case studies for why and how AV/IT convergence is playing out in enterprises, schools and other organizations. For example, multipurpose rooms are ultimately about maximum flexibility in terms of how people can collaborate. That means those rooms’ AV systems have to support whatever IT devices users prefer. A good selection of physical connectors—such as HDMI, DisplayPort and even VGA—is one way to accommodate laptops, tablets and smartphones, as well as devices such as Apple TV and Chromecast. Some AV integrators say they’re seeing a trend toward using USB as the backbone for a room. In those situations, employees and visitors would plug in, say, a laptop and have access to PTZ cameras, PA and other AV systems. The more plug-and-play a room is, the less likely that an organization will have to send a tech to each room to set up for meetings or staff up its help desk to field calls. So to maximize ROI, look for AV/IT solutions that are intuitive and flexible. That’s the goal of products such as Kramer Electronics’ digital presentation scaler switchers. Multipurpose rooms spread AV systems around a facility to maximize usage; it’s important to make sure ahead of time that the AV and IT backbones can handle the increase in traffic. “The network requirements increase dramatically,” said Randy Riebe, Polycom director of AV integrator business development. Security is worth considering during the traffic assessment. For example, if the forecast says the IT network can handle the additional AV traffic, consider partitioning the network using a VLAN. That architecture can be particularly valuable if visitors will be frequent users of multipurpose rooms because the VLAN means they can’t accidentally or intentionally access, say, the server with payroll information. An example of a recent multi-use project equipped with best-in-class AV. The What: Marshall Electronics and MXL recently debuted a multi-camera production system that brings together HD mini cameras, seamless camera switcher, web conferencing microphones, and new HDSDI to USB 3.0 converters into one comprehensive AV solution. This meeting production package is designed to work with Microsoft Lync, Go To Meeting, Blue Jeans, Google Hangout, and other popular web conferencing services. More info is available at www.mxlmics.com. Listen Up! Assistive listening solutions in multipurpose venues. The What: Listen Technologies is offering a Stationary RF system designed as a solution for AV and IT pros working with venues seeking assistive listening—for either legislative compliance or to meet the personal listening needs of their customers. The new systems are available in a range of configurations, offer a competitive price point and quality sound (with 20 dB less hiss than competitive products from other brands), and are backed by a warranty and Listen Technologies’ customer service/support. The What Else: Other features include: SQ Super Quiet Companding Switch (SQ can be disabled for compatibility with other assistive listening equipment); 57 channels offering maximum flexibility, with capabilities for language interpretation and assurance in finding a clear channel; look & Listen display on select receivers (Premier and Ultimate systems), allowing intuitive use, managing and programming; options for applications ranging from simple use in smaller venues to professional installation in larger venues and longer range of up to 3,000 ft. Visit www.listentech.com for more info.